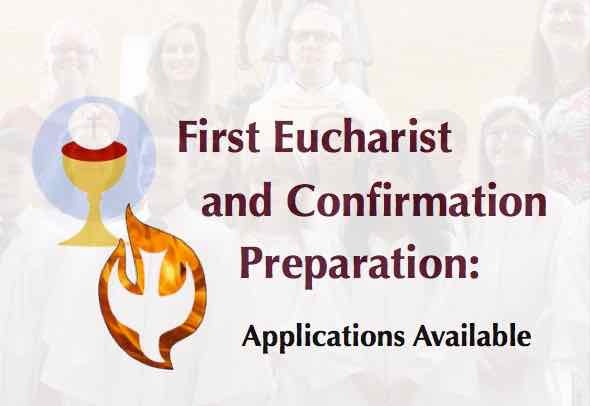 Applications for the preparation of First Eucharist and Confirmation are now available. Preparation for both Sacraments will begin in the Spring and will be celebrated in June 2018. Preparation for First Eucharist is open to all baptized, active, registered parishioners in Grade 2 and higher, who have completed at least 1 year of Faith Formation and are currently attending Faith Formation this year. The application deadline for First Eucharist is March 4. Preparation for Confirmation is open to all active, registered parishioners in Grade 6 and higher, who have completed Faith Formation and have received the Sacraments of Baptism, Eucharist and Reconciliation. The application deadline for Confirmation is March 31. Please contact Rachel at [email protected] to receive your application.